SpaceNet, launched in August 2016 as an open innovation project offering a repository of freely available imagery with co-registered map features. Before SpaceNet, computer vision researchers had minimal options to obtain free, precision-labeled, and high-resolution satellite imagery. Today, SpaceNet hosts datasets developed by its own team, along with data sets from projects like IARPA’s Functional Map of the World (fMoW). CosmiQ Works is an IQT Lab dedicated to exploring how the U.S. government can leverage new and emerging commercial space capabilities against national security problems. IQT is the non-profit strategic investor that accelerates the development and delivery of cutting-edge technologies to U.S. government agencies that keep our nation safe. DigitalGlobe is the world’s leading provider of high-resolution Earth imagery, data and analysis. With the most sophisticated commercial satellite constellation in orbit and cloud-based platforms that enable analytics and information extraction at scale, DigitalGlobe provides geospatial information that gives customers the confidence to make critical decisions. Radiant Solutions provides highly specialized, innovative geospatial multisource data, analytics, software and services to deliver critical insights and intelligence where and when it matters most. 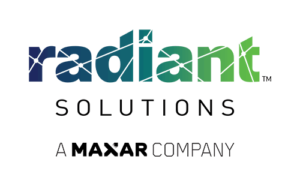 Poised to transform how customers support global mapping and intelligence missions at scale, Radiant Solutions harnesses the proliferation of pervasive information-gathering sensors, open-source software, cloud computing, machine learning and big data analytics.